I bought a water bottle about two years ago after my old one was stolen (I know, who steals a water bottle!?) While the new bottle was much better, since it was insulated and could keep water cold for more than a day (with ice added in) one of the things I didn’t like about it was a small rubber ring used to seal the cap. The rubber ring had a split in it (maybe to assist with the seal?) and it was difficult to clean, and eventually it broke from attempts to vigorously clean it. 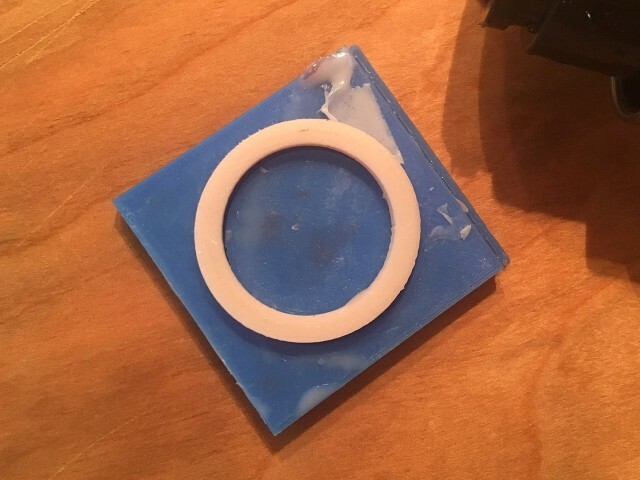 I replaced the sealing ring by 3D printing a small mold and then casting a replacement using Smooth-Sil™ 940 silicone. 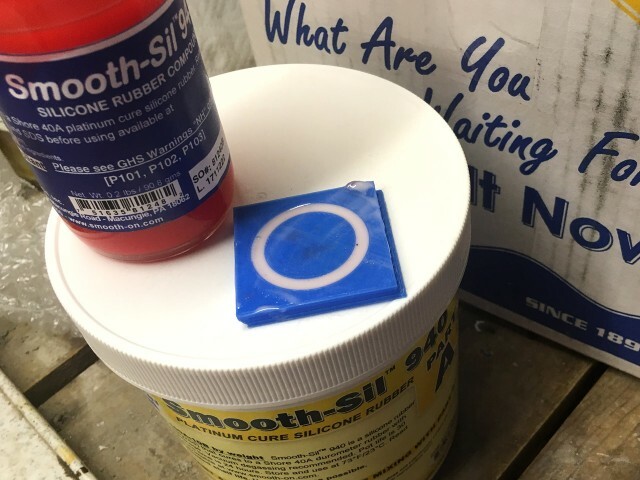 The silicone is a two part mold, with a volume of 100:1 for part B to part A, which is why you get a giant tub of silicone along with a small bottle of whatever the red stuff is. This was my first silicone casting at home for a personal project. I’ve done casting at work for prop making, but this time I didn’t have a vacuum chamber, and I was doing a tiny part all by myself. So how did it turn out? Pretty good! 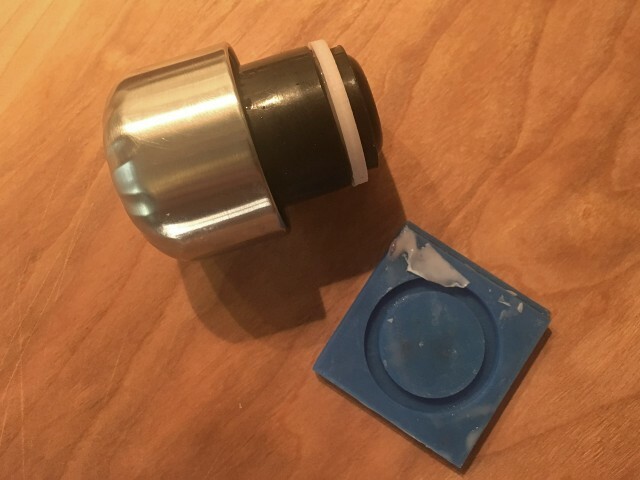 I used a digital scale and filled a cup with 10 grams of part B, then added 1 gram of part A and mixed it all up with a popsicle stick and smeared it into the cavity of the 3D printed PLA mold. I let it sit overnight then used a sharp knife tip to pry it out. There was a thin skin around the piece but it peeled right off. 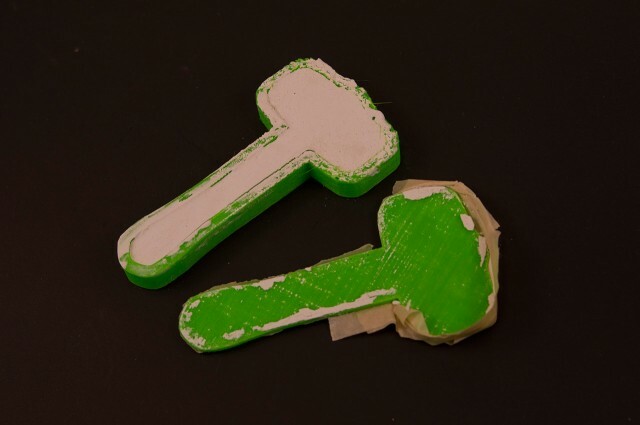 I’ve got plenty more silicone, and it is food-safe, so I want to experiment with making some food molds, and yeah, I’ll probably 3D print the objects to create the molds from, taking a page from Anna Kaziunas France. 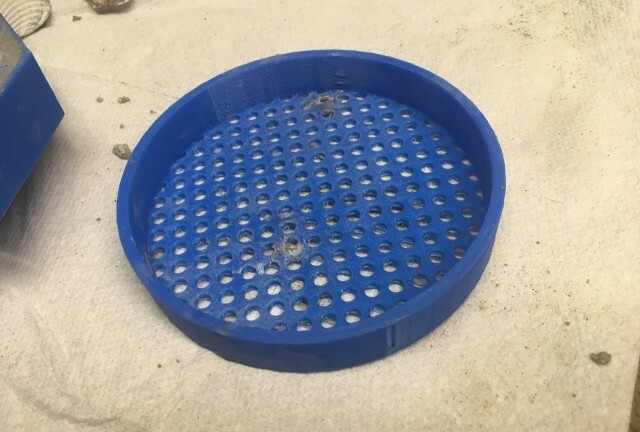 I needed a sifter to remove some small pebbles from concrete mix, so I designed and 3D printed one. 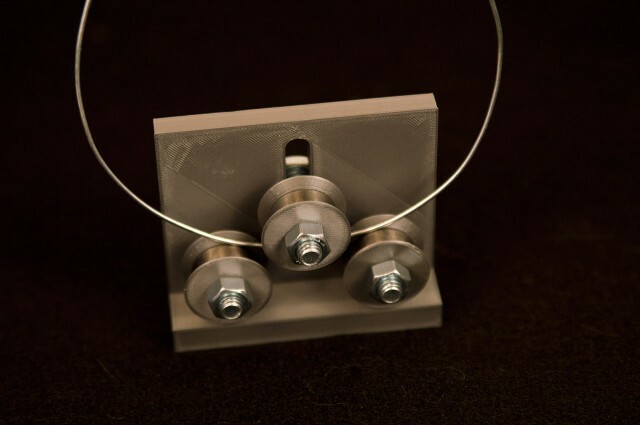 Now, like many things that get 3D printed, you don’t always get it right the first time. After testing the sifter I decided it needed larger holes, so. I started on version 2. 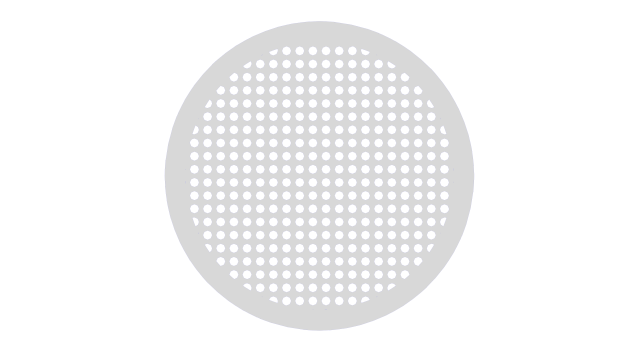 For version 1 I used Inkscape to quickly create a grid of circles (using the clone feature) and then differenced them from a circle. 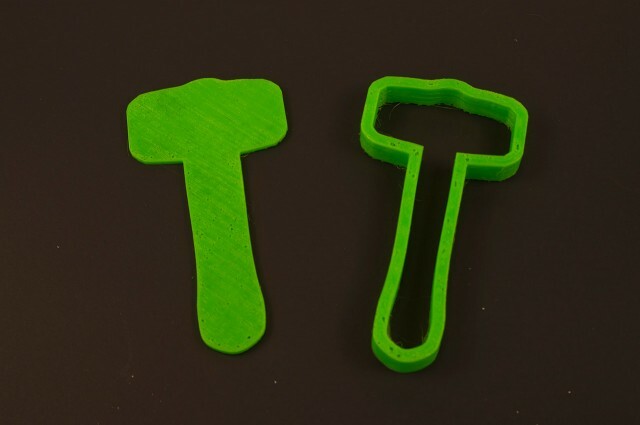 Once I had this done I exported as a DXF file and used that within OpenSCAD to create the bottom of the sifter. I added a ring and Bob’s your uncle. 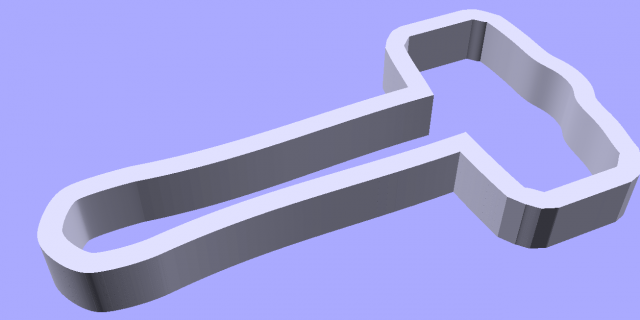 I use this Inkscape/DXF/OpenSCAD/extrude method sometimes, because it seems like the right way to do things, or because it’s pretty fast. But it’s not always the best. 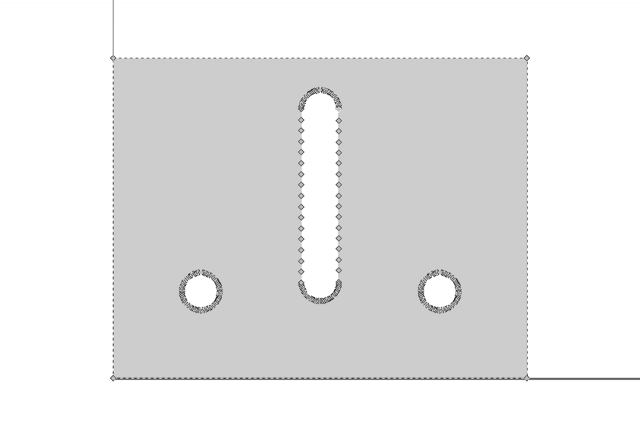 The problem with the Inkscape/DXF/OpenSCAD/extrude method is that you have to go back to Inkscape and redo your DXF file if you want to make changes or tweak the design. This may not be an issue for many designs, but for some, I want the flexibility to easily change things. 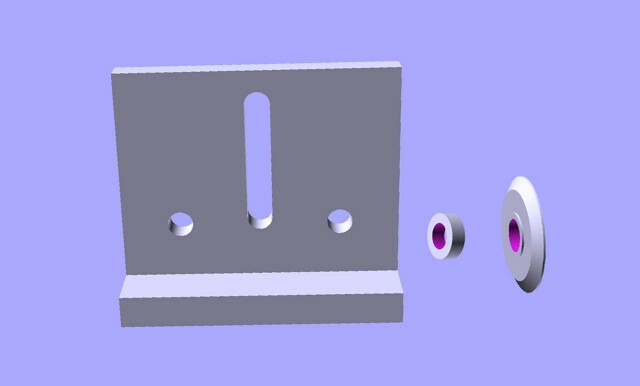 While the method of doing it all within OpenSCAD has advantages, the one way it suffers is when it comes to render time. I should note that in OpenSCAD you can choose how “smooth” circles are by applying a number between 1 and 200. It basically sets how many “sides” a circle has. You can typically use 100 and circles will look pretty circular, but you can also drop the number down to 6 for hexagons, 8 for octagons, etc. That said, at a setting of 100 rendering the sifter took nearly 15 minutes on my 6 year old MacBook Pro. Changing the circles to hexagons with just 6 sides took about one minute to render. Hey, it’s a sifter! 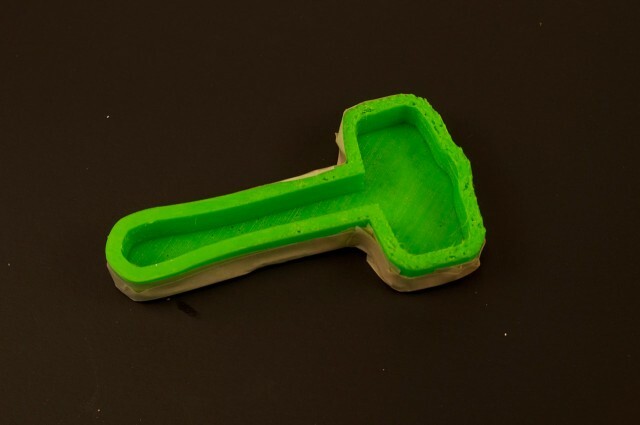 Yes, I designed and 3D printed a sifter. I often design things and then print them overnight so I have them the next day. 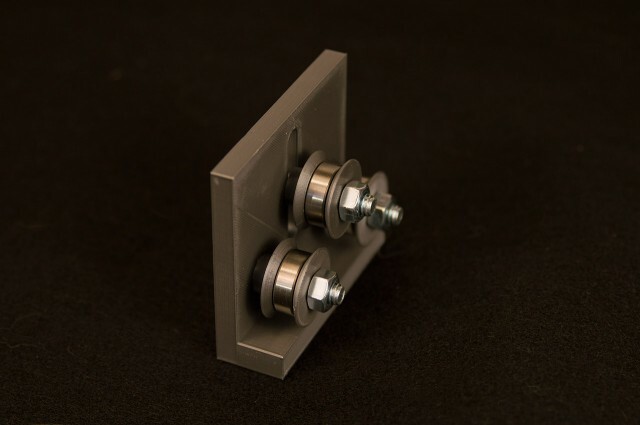 3D printing is awesome, but it’s often not fast. 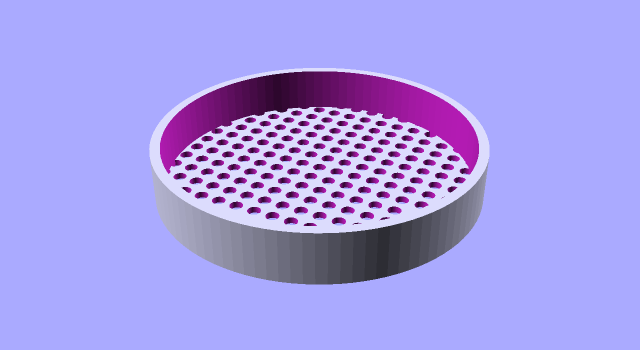 I did consider trying to make a sifter plate with a drill press, and then I remembered I had a laser cutter, and considered using that, but ultimately I was not in a hurry and 3D printing one seemed like a good idea. 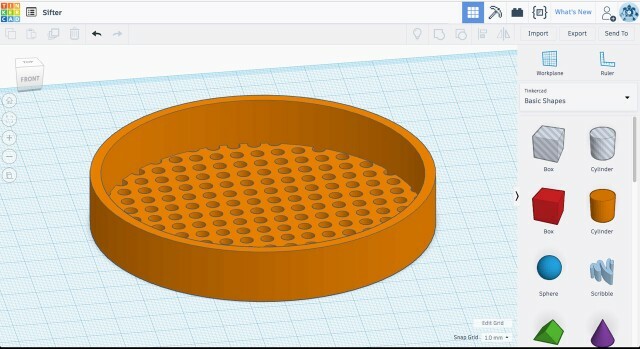 Speaking of good ideas, I’ve been looking at Tinkercad recently, and while I wanted to be convinced it wouldn’t be easy to do what I wanted, it actually was pretty easy to do what I wanted, so I redesigned my sifter using Tinkercad. The smart duplication feature made it fairly simple. 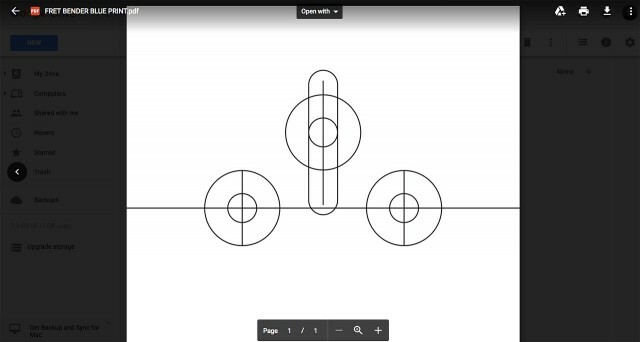 While I’m a bit more impressed with Tinkercad than I thought I would be, I still have the problem I had with Inkscape, that if I want to tweak some values, I need to redo work. In fact, I have to pretty much create a whole new model. For simple designs, this isn’t a huge deal, but it is a bit of a pain. I can easily edit the OpenSCAD files I created seven years ago, which is something that is important to me. That said, I do want to explore other software, because reasons, you know? I decided to start with something less complex, and used a 2.5D object instead of a 3D object. 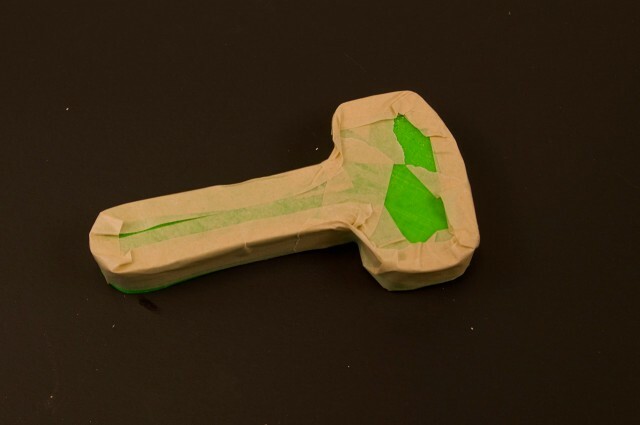 I had an illustration of a hammer, which seemed to be a simple shape, with no weird inside parts or sharp corners. I started by opening the vector file in Inkscape. Once I had the file open I used Inkscape’s dynamic offset feature to extend the shape into a larger piece so I’d have “walls” for my mold. I did a Boolean difference between the original and the scaled part to get the wall piece, with the wall pieces being approximately 4mm wide. I also created a bottom plate that the wall piece would attach to. I did not make it fit with pins or any other alignment method, I just ended up using tape to hold the pieces together. 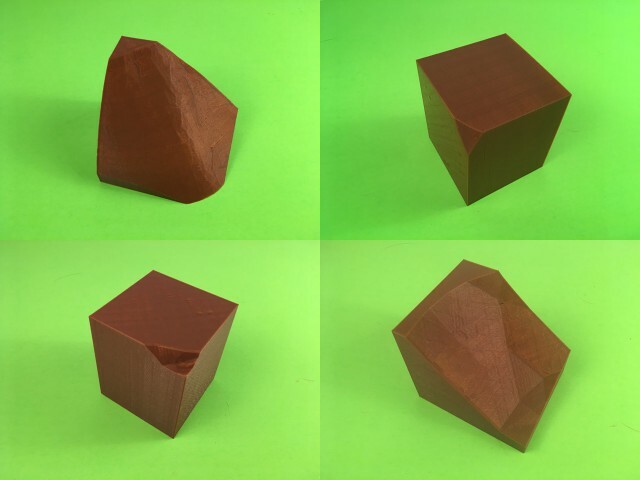 Here are the modeled pieces. The wall piece was easy enough to flex around, but seemed strong enough to hold up for the casting. And here are the printed pieces. 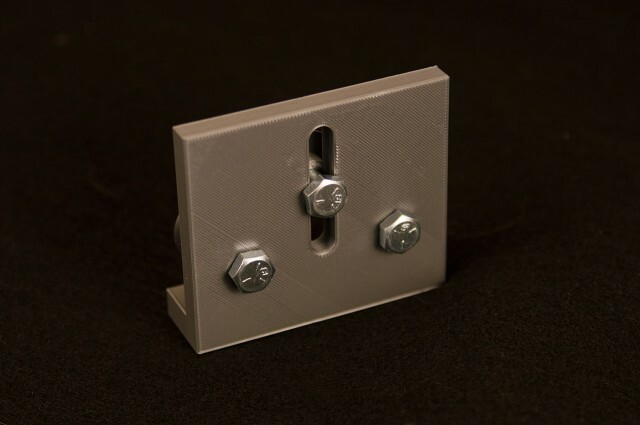 The flexible filament did not print as well as PLA does, and there were some rough parts on the top of the walls, but it wasn’t going to matter for these purposes. I put the two pieces together and applied some masking tape to hold them. Since I was going to use plaster I knew that it didn’t have to be too water-tight to hold the plaster in place. 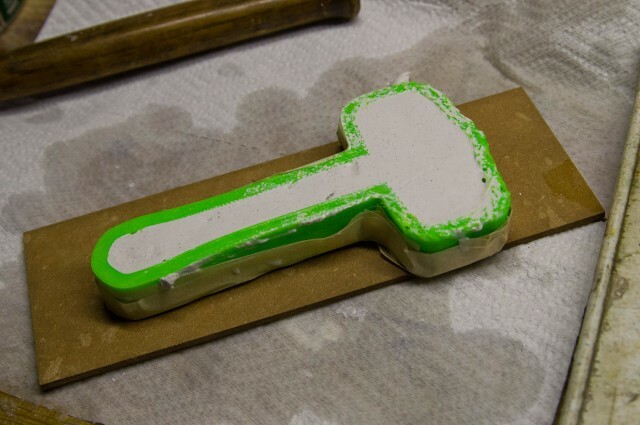 …and then was able to flex the wall piece enough to get the plaster out of the mold, so that worked pretty well. Again, this was not a complex shape, which really helped as I just had to push the piece straight down through the mold. 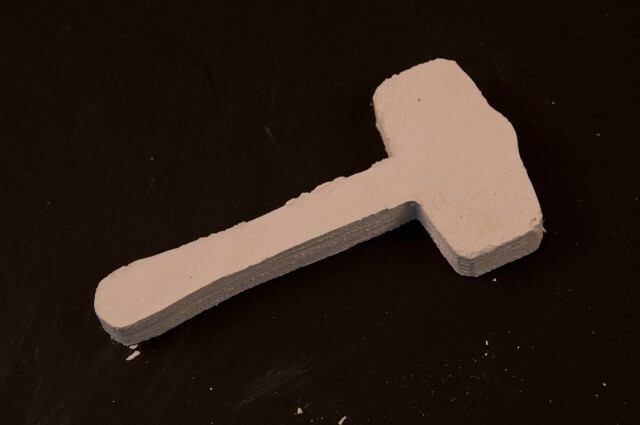 And here’s my (tiny) plaster hammer. I like how it turned out. The edges are not perfect, but then, what is, Right? 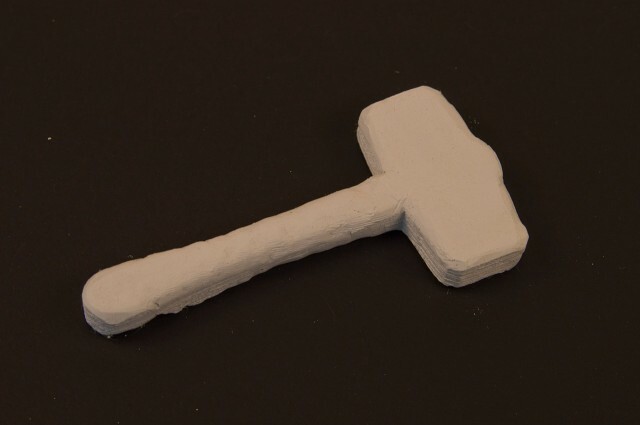 I ended up making two of them, and with one I found that it was fairly easy to shape the edges using tools, so my 2.5D hammer (sort of) became a 3D hammer. 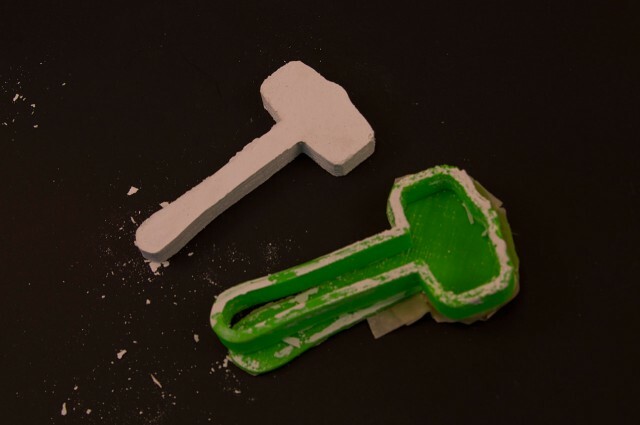 We the Builders is a project that uses crowdsourced 3D printing to assemble large sculptures. 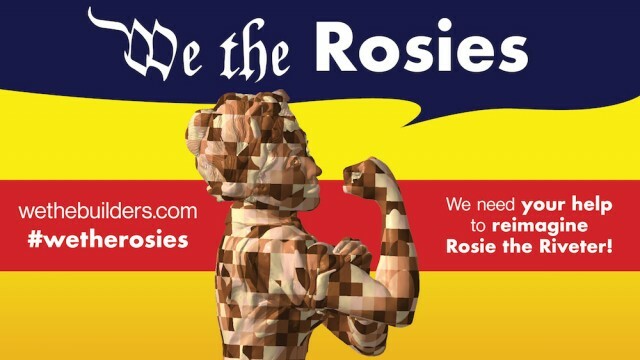 For the most recent build, they decided to celebrate the contributions and diverse identities of women and non-binary makers by scaling up a sculpture of Rosie the Riveter to monument-size and printing her in a spectrum of skintones. The sculpture will be over six feet tall and made up of 2,625 parts. 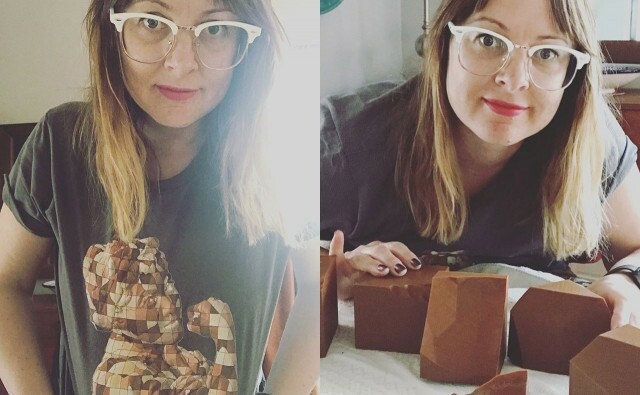 I posted about this on the Milwaukee Makerspace Facebook page and asked for people interested in helping, and a woman named Gwen was interested. Seems her grandmother was an actual “Rosie” back in the day. We met up at Milwaukee Makerspace and tried to print a piece for her, and because 3D printing is full of failure, did not succeed. So I printed it at home. And then I printed more for me, and more for her, and in total I think we did 10 parts. Sadly had to hit the road for BAMF so I didn’t get to print more, but it looks like (as of writing this) there are less than 250 pieces and we’ve still got five days. When Gwen showed up to pick up the pieces (she offered to ship them) she was wearing an awesome Rosie shirt depicting the sculpture, so I asked her to get a photo of it with the pieces, and she did! 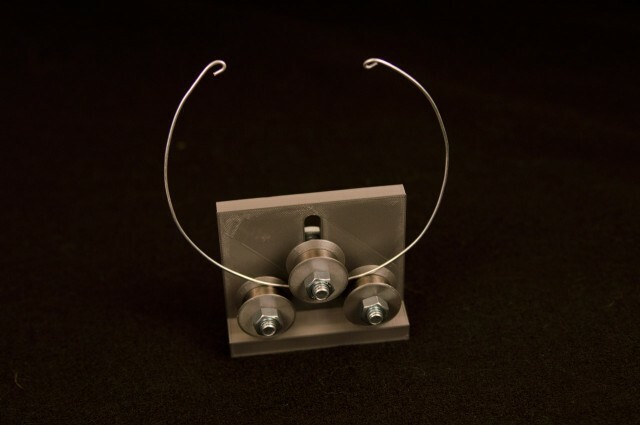 We’ve got a project at Brinn Labs where we need to bend some 16 gauge wire. 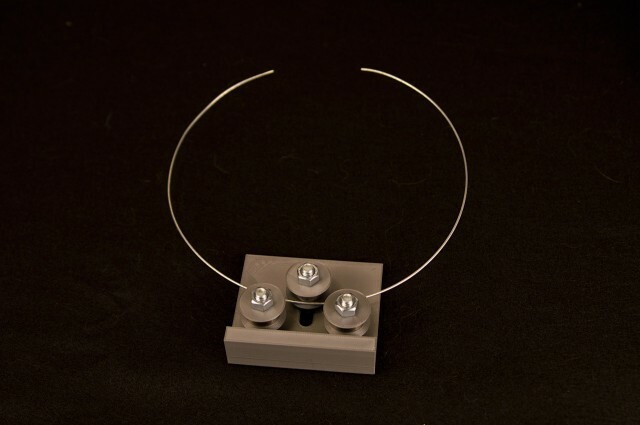 The wire bends very easily, in fact, too easily, and you can bend it by hand, but you can’t really get nice curves. I looked up “wire benders” and found “fret benders” which people use to curve the frets for guitar building. I designed three parts, and then printed the body and three spacers and six guides. You’ll notice a small lip on the guide piece. That’s to just touch the inside of the bearing so they can roll smoothly. The bearings? Yeah, tear apart that fidget spinner! We’ll need three bearings. We’ll also need three 5/16″ bolts and nuts, though you could certainly use 8mm if you’ve got those handy. Hey, look, we’ve now got a wire bender! This was a really simple build, and since fret benders often cost $50 to $100 (though I saw one for $25 on eBay) this was pretty dirt cheap. I don’t know if it’s up to the task of bending frets, but it should work fine for the wires we need to bend. If I get around to it I’ll clean up the files and release them. You never know when you might need to bend some wire!